You might want to stick to using your fingers from now on. UK-based beauty professional Stevie Miller was surprised to see a small hole on her relatively new makeup sponge. After assuming that it was nothing but dirt, she used a pair of tweezers to pull it out. 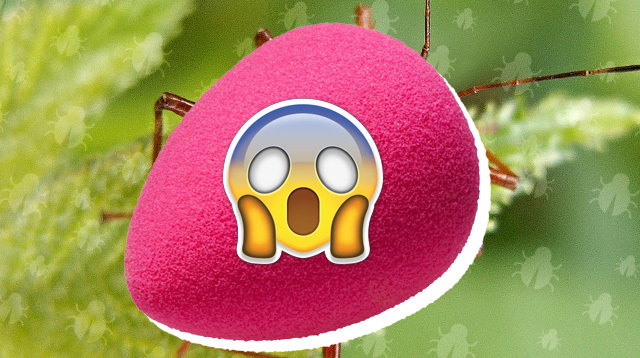 To her surprise, it wasn’t just dirt—it was a bug. Like, a creepy tiny black bug. WITH WINGS. To make things worse, Stevie decided to cut the sponge to see if there was anything else inside, only to be greeted by another bug. GROSS. "We are unable to verify the authenticity of the video or to confirm whether the sponge shown in the video is in fact a genuine Beautyblender purchased from an authorized retailer. Often imitated, but most certainly never duplicated, the Original Beautyblender is produced in an ISO Certified U.S. manufacturing facility that upholds the highest standards in quality control. As a result, it would be impossible for a sponge to come from our facility in the condition depicted in the video. Regardless of whether the video is legitimate, instances like this reconfirm how important it is for consumers to purchase their Beautyblender products only from an authorized retailer to ensure that they receive the level of quality and performance that the Original Beautyblender is known for. To find a list of authorized retailers in your area please visit Beautyblender's website." Lesson learned, make sure to only purchase beauty products from authorized sources—it’s just a million times safer that way.